The Moon orbits the Earth roughly once a month. Looking down on the Earth and Moon from above the Earth's north pole, we see that its revolution is in the same direction as the Earth's rotation (and also the Earth's revolution around the Sun). 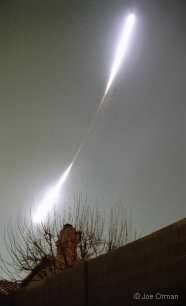 The Moon shines by reflected sunlight. Therefore, at any time only one half of the Moon, the side facing the Sun, is illuminated. The dividing circle between the light side and the dark side is called the terminator. The illuminated side of the Moon is not necessarily the half which faces the Earth. Depending on the relative positions of the Sun, Moon, and Earth, we see different fractions of the Moon illuminated. These are called the phases of the Moon. At new moon, we can't see any of the illuminated half of the Moon; at full moon we can see all of it. Halfway in between new and full moon, we see half of the illuminated half of the Moon, or a quarter of the Moon. First quarter occurs as the Moon moves from new to full; third or last quarter occurs as the Moon moves from full to new. Between the new and quarter moons, only a small fraction of the Moon is illuminated; we call this a crescent moon. Between the quarter and full moons a larger fraction of the Moon is illuminated; we call this a gibbous moon. When the Moon moves from new to full, it becomes more illuminated, and we say that it is waxing. When it moves from full to new, it becomes less illuminated, and we say that it is waning. On any particular night, the Moon will essentially be motionless. As can be seen from the diagram above, a full moon must therefore rise around 6 P.M., be overhead at midnight, and set around 6 A.M.
A first quarter moon must rise around noon, be overhead around 6 P.M., and set around midnight. Crescent moons are overhead during the day, but they are generally only visible near sunrise/sunset (both because of their small illumination and the brighter light from the Sun). Question: if it's 3 A.M. and the Moon is rising, what phase is it? The synodic month is defined as the time it takes for the Moon to return to the same position relative to the Sun, e.g. from full moon to full moon. The synodic month is equal to 29.5 days. The sidereal month is defined as the time it takes for the Moon to return to the same position relative to the stars; it is equal to 27.3 days. The sidereal month is shorter than the synodic month because of the revolution of the Earth around the Sun, as can be seen at the right. The Moon doesn't have to travel as far around its orbit to line up with the same distant star. The Moon's orbit is inclined at an angle of 5° to the Earth's, so it is usually either above or below the plane of the ecliptic. The points where it crosses the ecliptic are called the ascending and descending nodes, depending on whether it is moving north or south, respectively. The line connecting the two nodes is called the line of nodes. Question: a line is also the intersection of two planes; what are those two planes for the line of nodes? Sometimes, when the Moon passes through the ecliptic, it will happen to be full (directly opposite the Sun) or new (directly towards the Sun). At these positions and phases, an eclipse will occur, when the Moon or Sun "fails to appear", which is the Greek meaning of the word (this is also the origin of the name ecliptic). A lunar eclipse occurs when the Moon is full and it is close enough to the ecliptic that it passes partially or completely through the Earth's shadow. A lunar eclipse can be observed from anywhere on the night side of the Earth. The darkest part of the Earth's shadow is called the umbra; it is where the Sun's light is completely blocked out. The umbra is not totally dark, however, because the Earth's atmosphere scatters red light into it. The Earth's partial shadow is called the penumbra; it is where the Sun is only partially blocked by the Earth. When the Moon completely enters the umbra, a total lunar eclipse occurs as the Moon almost disappears from view. The long-exposure photograph at the right shows the entire span of a total eclipse. Because of the scattered light in the umbra, the Moon does not completely disappear but takes on a dull red hue which brightens toward the edge of the umbra. A total lunar eclipse can last as long as 1 h 42 min, depending on how close to the center of the umbra the Moon passes and its distance from the Earth. The total lunar eclipse shown above right lasted 1 h 18 min. A partial lunar eclipse occurs when the Moon only passes partway through the umbra. The eclipse at the right was 92% total (more details). A penumbral lunar eclipse occurs when the Moon only passes through the penumbra. A different kind of eclipse, a solar eclipse, occurs when the Moon is new and it is close enough to the ecliptic that its shadow partially or completely reaches the Earth. The Moon's umbra forms a circular region on the surface of the Earth, and if you are in that shadow the Sun is blocked out. This is a total solar eclipse. The Moon's umbra has a maximum diameter on the surface of the Earth of 270 Km. 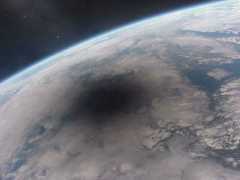 The umbra of the eclipse of August 11, 1999 can be seen at the right. A total solar eclipse is dark enough that animals will actually begin their nocturnal habits, e.g. birds will stop chirping. Once again, however, a total solar eclipse is not completely dark, because the dim glow of the Sun's atmosphere can be observed around the edge of the Moon. The shadow moves rapidly across the surface of the Earth, sweeping out a narrow path as it speeds by at about 0.5 Km per second. 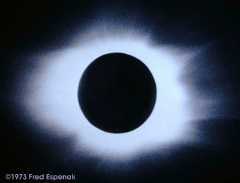 As a result, the maximum time that a total solar eclipse can last is 7.5 min, depending on the shadow's size and speed. If you are located in the Moon's penumbra, which is much larger than the umbra, the Sun is only partially blocked out. This incomplete covering of the Sun is called a partial solar eclipse. When the Moon is farthest from us, the tip of the umbra doesn't quite reach the Earth. From our point of view here on the Earth, the Moon does not quite cover the Sun, so a ring of sunlight will surround it. This type of partial eclipse is called an annular eclipse. The eclipse at the right is just barely annular. As mentioned above, eclipses can only occur when the Moon is close to a node and it is also either full or new. For this alignment to happen, the line of nodes must point near the Sun. Just like the Earth's axis, the line of nodes is relatively fixed in space. With no other forces acting, the line of nodes would therefore be in line with the Sun every six months. However, also like the Earth's axis, the gravitational force of the Sun on the Moon causes the line of nodes to precess. This precession is a much more noticeable effect than the Earth's precession, with one every 19 years. As a result, the time between alignments is decreased to about 5.4 months. Because of the finite size of the Earth, Moon, and their shadows, multiple eclipses can occur whenever the line of nodes points near the Sun. So, eclipses are actually very common! During a one-year period, there can be between two and five eclipses of each kind (solar and lunar), with a total of between four and seven. This includes partial and penumbral lunar eclipses, and partial and annular solar eclipses. Lunar eclipses are much more likely to be observed, since anyone on the night side of the Earth can see them. Solar eclipses, on the other hand, cover only a small fraction of the Earth, and often occur over unpopulated locations such as the polar regions or the oceans. The information in this table is derived from NASA's The Eclipse Home Page, where you can find lots more information about eclipss..